There, they hope to witness the historic passing of the Crystal Comet at a hair-raising gala and monster skull-ebration. Turns out the stage isn't the only place for drama -- things get catty between Nefera de Nile™ and Catty Noir™. The two (sold separately) battle it out in to-die-for comet-inspired gala outfits with metallic materials and faceted sculpting detail. Nefera de Nile™ doll, daughter of the Mummy, is ready to rule in a dress with golden snake-decorated bodice, dramatic shoulder and metallic signature teal skirt. Mummy wrap-inspired teal shoes, a snake-decorated headband, scary cool earrings and teal fingerless gloves are wicked cool. Plus, a piece of the ""comet crystal"" is out of this world! Use the doll stand and doll hairbrush to style Nefera doll to capture a monsterrific moment. For a full cast of ghoulish characters, collect all of the Monster High™ Boo York dolls (sold separately). 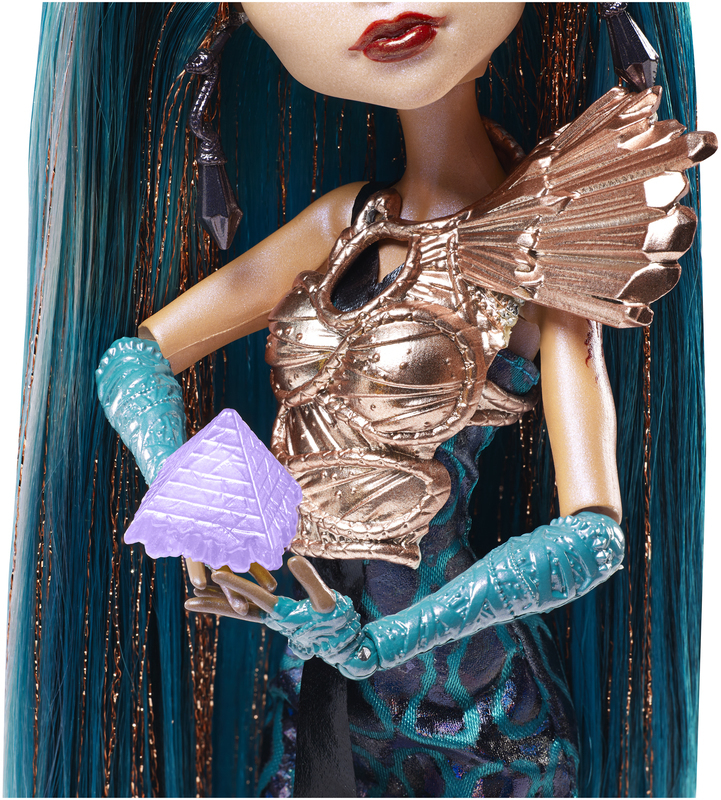 Nefera de Nile™ doll is ready to rule in a dress with golden snake-decorated bodice and metallic signature teal skirt. Mummy wrap-inspired teal shoes, a snake-decorated headband, scary cool earrings and teal fingerless gloves are wicked cool. A piece of the comet crystal is out of this world! 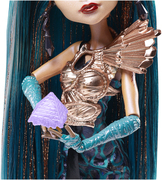 Use the doll stand and doll hairbrush to style Nefera de Nile™ doll to capture a monsterrific moment. Collect all of the Monster High™ Boo York dolls for a full cast of ghoulish characters (sold separately)!